Beautiful and finished 3 bedroom home for short term rental. Entire home, backyard with deck and BBQ. Sleeps 3- 5 comfortably. Located in Riverside/Leslieville Toronto. 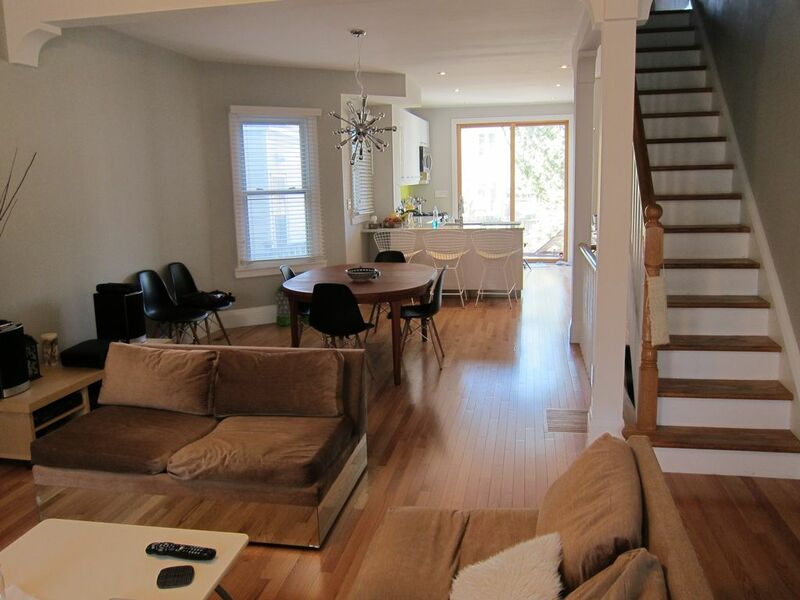 Down the street from a Park, this lovely home is steps to 24hr transit that takes you directly downtown in minutes. Lots of great bars, restaurants, coffee shops, and a Grocery market - all within walking distance. A prime location for families looking for a Toronto getaway. High Speed Wifi and Cable Tv Included. Perfect for three guests, two couples or families with one to three children (over the age of 8). Rental includes a fully equipped kitchen stocked with coffee, tea, milk, orange juice, eggs, bread, cooking oils, spices and many other pantry staples for your use. Also basic toiletries such as soap, shampoo, conditioner, toilet paper, laundry soap, paper towels are provided free of charge. Clean towels and Linens are provided for all guests. Unit is professionally cleaned between each stay. Close to many popular attractions like the CN Tower, Toronto Beaches, Metro Toronto Convention Centre, Royal Ontario Museum, Ripley's Aquarium, Toronto Eaton Centre, Air Canada Centre, Chinatown, Distillery District, St. Lawrence Centre Farmers Market, Art Gallery of Ontario and the Toronto Islands. Must treat home as if it were your own. Street parking permits available upon request. $25 CDN per week. Cooking oils, large selection of spices, basic condiments, and other pantry staples like coffee, tea, sugar and flour provided. Sarah has a very nice house in Toronto that is very clean and has everything you need for a nice stay. The beds were comfortable and bathrooms tidy. Sarah even supplied extras such as some basic food items and coffee for guests to enjoy. Many nice restaurants and things to do in walking distance from the place. We really enjoyed our stay and would recommend this to anyone coming in for a short or extended stay in Toronto. Also convenient location. Sarah was very nice to us. The house is beautiful. It is close to downtown only 5 minutes with Uber. The owner is nice and kind. I would not hesitate to stay here again! Amazing, Lovely and just Perfect!!!! My mom sister and I spent 4 nights in this amazing home. The location was perfect and the house is just beautiful!!! So many great shops and eats around the corner and everything that Toronto has to offer is just a short transit or uber ride away. So many wonderful places in walking distance. Sarah's kitchen had all the supplies we needed to make breakfast each morning and coffee. There truly is not one thing we would change..thank you for opening your beautiful home for us to stay...WE LOVED IT! Sarah's house is lovely, very clean and well-equipped. The downstairs bedroom is huge with an ensuite and separate laundry room. It's not for tall people but we were fine! We found it very easy to get to and from downtown etc. using Uber mostly as it was cheaper than 4 people on a tram although we did travel on the 501 a couple of times for the fun of it. Sarah met us when we arrived and is very helpful and friendly. A great place to stay!